To register for a class, either click "Sign Up Here" and sign up online or e-mail kayeamestraining@gmail.com and tell us which class, date, and time you would like to attend. Please include your name, phone number, dog’s name and breed. You will need to fill out this registration form and bring it to your first class along with the appropriate fee if you have not paid online. We accept cash, check, MasterCard and Visa. You will need to bring tiny tasty treats along to class. If you forget, Woof 'n Tails next door has an array of healthy treats for your dog which you can purchase before class. Your dog must be on a 6-foot leash and collar or appropriate harness. Choke collars are allowed but must be fit appropriately. Please, no retractable leashes. Teaching your dog is a family affair, and all members of the family are welcome to participate. Children who are not helping to teach their dog must be able to entertain themselves quietly outside of the training ring. Each session is 45 minutes long. Oh Yes, Don't forget your dog! Get your puppy off on the right paw with our Puppy Manners Class. This class is for puppies 10 weeks to 7 months of age and all small dogs. 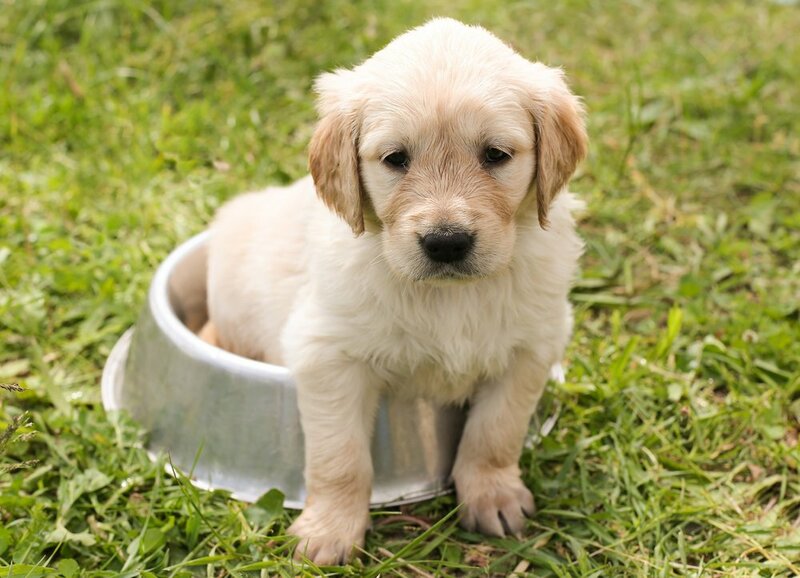 In this course your puppy will learn sit, down, stay, walking at your side, leave it, greeting friendly strangers, coming when called, problem solving and much more! This class also helps prepare you and your puppy for the AKC S.T.A.R. Puppy Certification. At the end of the course, Kaye will administer the AKC S.T.A.R. Puppy Test, which gives you the opportunity to earn this title. For more information on the S.T.A.R. Puppy Certification, click here. This class is a great first step to help get you and your dog working together in harmony. Beginning Manners Class is for puppies and dogs who are 7 months and older. In this course your puppy/dog will learn sit, down, stay, walking at your side, leave it, greeting friendly strangers, coming when called, problem solving and much more! This class is a great first step to help get you and your dog working together in harmony. This combined class is for puppies and dogs of all ages and sizes. In this course your puppy/dog will learn sit, down, stay, walking at your side, leave it, greeting friendly strangers, coming when called, problem solving and much more! This class teaches practical exercises taken from the AKC Canine Good Citizen Test and helps you and your dog prepare for taking the examination. The Canine Good Citizen test is a nationally recognized program that instills a sense of responsibility and good manners in dogs and owners alike. At the end of the course, Kaye will administer the Canine Good Citizen Test, which gives you the opportunity to earn this title. For more information about the Canine Good Citizen Program click here. This is a you never know what you will be learning kind of class! In this class, the students decide that they want to learn and Kaye does the rest! There is no end to what you will learn. Trick Dog Certification, Community Canine Certification, Rally Obedience, and Advanced Obedience are only a few of the activities that are presented in a fun manner. Get ready to laugh and have fun learning while playing with your dog! AKC Rally Obedience involves you and your dog navigating your way though a course consisting of 10-20 different signs labeled with different skills that you and your dog are supposed to complete. Rally promotes teamwork, obedience, and focus. For more information on Rally, click here. Fee is $10.00 per drop-in class. Join us for drop-in Rally Run-Through courses Mondays at 7:00 pm. This is a drop-in class that teaches you and your dog how to perform in the show ring. Whether you are an experienced or novice handler, Kaye will help you improve your performance as well as your dog’s performance in the ring. Kaye is a problem-solver for show dogs, both for the breed ring and the obedience ring. She will help you get you through the toughest of problems! Join us for drop-in class Tuesdays at 7:30 pm. Agility is a great way for dogs and their people to play together. Over, under, around, and through jumps -- what fun! Come join us and have more fun and laughs than you could ever imagine. In this class you will learn the correct way of working your dog in agility with our instructor Bobbi Dochat. Bobbi has brought us full size regulation equipment along with a tremendous amount of knowledge in handling dogs and working agility for fun and competition. We are lucky to have her in our facility to help you and your dog succeed in having fun together learning agility. Please email kayeamestraining@gmail.com to register!